I think this one is my fave of the ones that I made. I love Saber Lily's design and always wanted to make a wallpaper of her. Ok, so first things first. I always loved your minimalistic approach to wallpapers. You've definitely got a type of style developed and you really know how to capture your images just right with what you do too. This is especially the case. I don't know what I like more, the fact that you chose probably one of the best scans possible for this, or the fact that you incorporated Art Nouveau perfectly. However, I do know one thing. I'm getting into it right now. So Saber, you utilized one of my favorite scans of the Lily Saber section. Loving that bold outline on her, and that texture effect really fits nicely as well as the filtering. That lighting really makes her look angelic! I'm also glad that you stuck with the lilies that were in the original scan and gave them that little bit of extra pizzaz to push them above and beyond as well. Very simple things, but they go so far with this piece. However, it's the overall background that really shines. I was a big fan of Candy-chan's and Tama-Neko's Art Nouveau pieces, and now I can say that I'm a fan of yours too. You captured all those nice subtitles of it, while still making it unique and individualist. I'm totally digging the pattern inside the framework too, and the lily on the left side was a very nice touch as well. It could of been easy to go overboard with the lilies or the petals, but you didn't. Overall, it's got just the right amount of everything, which gives it a very classy and sophisticated look. By far one of the better Fate/Stay wallpapers out there, and with a section that is full of Saber wallpapers this is one of the best. You really outdid yourself with this piece. 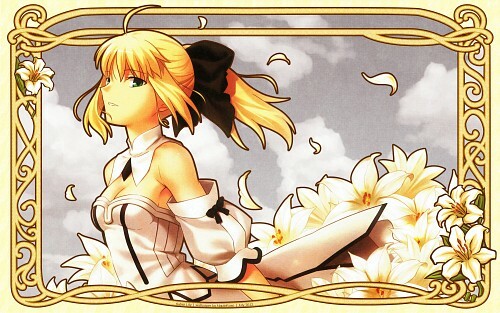 I do love the Saber Lily scan, it's very elegant and soft. I loved this wall! The whole Art Nouveau feeling it has is just stunning and so eye-catching at the same time, I simply can't look away. The background too, it's simply amazing. I'm so glad someone finally made a wallpaper with this scan! I don't really know what else to say about it, since Cyanide covered everything already :) It's absolutely lovely. Very pretty! You did a nice job with the frame and chose a scan that fits into it perfectly! WOUAAAAH !I'm take it ! It's very beautiful ! Lovely, clean, bright and very elegant... Wahooooo :DDDD! Nice wallpaper. ^_^ And the colors are very pleasant.